Under the top frieze are two registers. 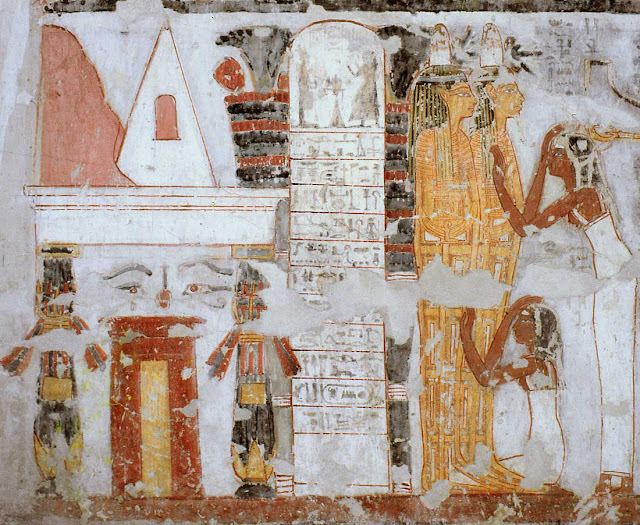 The upper register has a depiction of the divine judgement hall, with the very classic scene of the weighing of the heart in front of the courthouse of the gods. 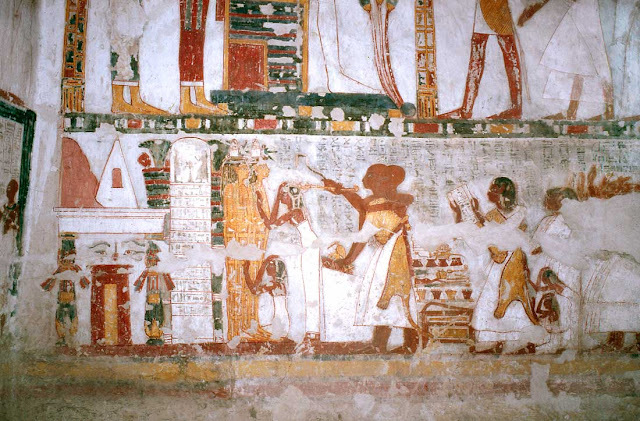 The bottom register shows the very classic scene of the opening of the mouth, which takes place in front of the entry of the tomb. There is no middle frieze. This motif occurs elsewhere, with Anubis, in the shape of a canine reclining on the roof of a chapel. On this wall he faces right, towards the entrance. He wears, as usual, a ribbon around his neck and a whip which extends from the middle of his back. Between each chapel are again two khakeru, the ancient plant motif, surmounted here by a solar disk. At the top, to the right, sit thirteen judges with Re at the head. Behind him sit Atum, Shu and Tefnut, Mont and Tjenenet, the next two are doubtful, then Osiris, Horus-son-of-Isis, Isis, Nephthys, and finally another dubious goddess. Behind the them, Khonsu is squatting in front of offerings, maybe accompanied by his mother, but lost (except for a knee) in the damage. It would have been important to make the judges favourable! The text which is above the scene is a (poor) summary of some of the formulas used in chapter 125 of the Book of the Dead. Usually there are found in tombs of the Ramesside period more extracts from this book; perhaps the longitudinal corridor included some of the others, which have disappeared. Here is the proposed translation (difficult, but inspired by Davies): "Words spoken by Horus-son-of-Isis by his father Osiris: 'The Osiris, high-priest of Menkheperrer, has come to ones for whom righteousness is upon his mouth and righteousness upon his hands. He never wrought wickedness (against) the great ones in this land, and transgression has not been found in him. He did what the king desired and that with which the gods are pleased. His heart has come forth justified. He has not been accused, he has not been found sinful. The great Ennead of the gods in the halls of Truth rejoice greatly over a just man who is declared just' ". 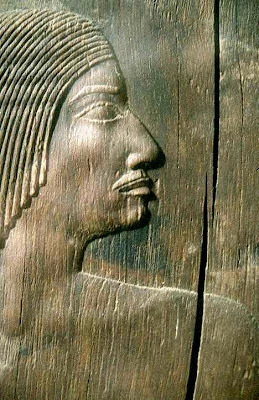 The god Osiris is seated under a painted lightweight wooden building surmounted with a frieze of solar cobras. He has green skin, colour of a decomposing corpse, but especially that of new vegetation. This is a reminder that these are the humours which flow out of the body during the decomposition of Osiris which constitutes the flooding, synonymous with the rebirth of the plants and of the justified deceased. Osiris is sheathed in a white shroud, wearing the atef-crown and holding, as usual, in his hands a was-sceptre plus his flail and his crook. Over a large golden necklace hangs a second one from which can be seen the counterweight hanging behind him. The end of the second necklace is rectangular in the shape of the facade of a palace or temple. Behind the god are his two sisters and defenders, Isis and Nephthys. 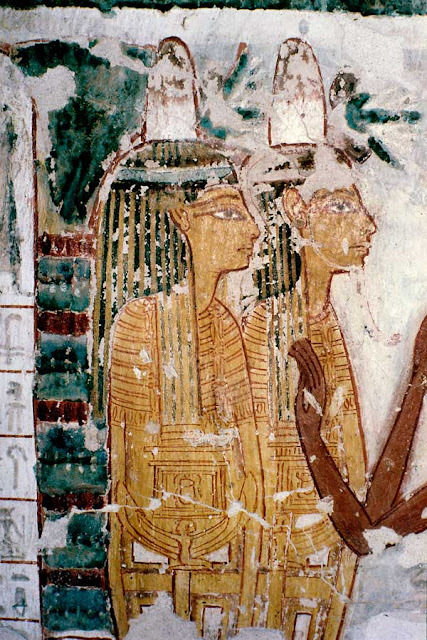 Both are clothed in an archaic tight-fitting dress with shoulder straps, red for Isis and green (currently; but it could have been blue originally) for Nephthys. 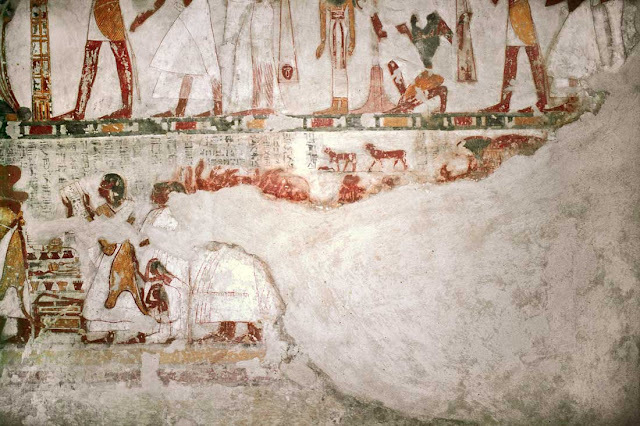 In front of Osiris, the Four Sons of Horus, here all anthropoid, stand on a lotus flower.. A completely white area, in the top right corner, was intended to receive the text, but has remained blank. 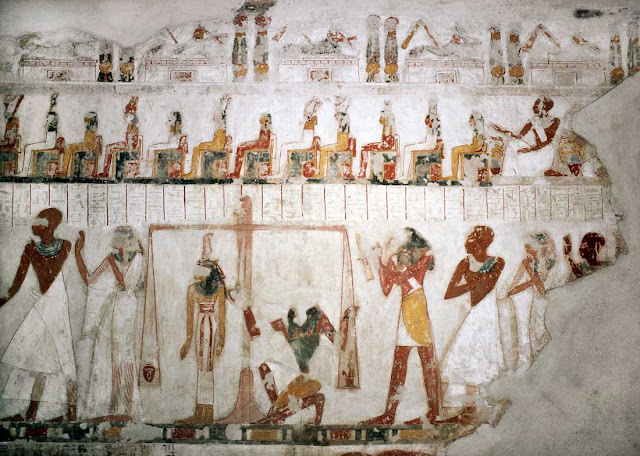 The representation of the tomb and the coffins is very successful. With beautiful multicoloured closed lotiform columns sustaining a roof, on top of which is a pyramidion placed in front of the Theban mountain. The artist didn't forget to include in the pyramidion its sky-light, destined to receive a statue or a stela. Between the columns, the entry has been created in red, probably to imitate granite, with a bright yellow door. Two enormous lotus bouquets rise on either side of a stela which carries a classic offering formula. 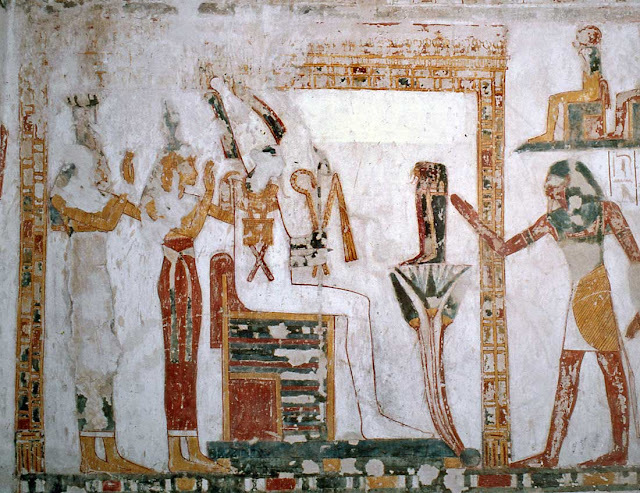 The arched top shows the deceased in worship in front of Osiris. The text of the stela states: "Wishing to give an invocatory offering to Osiris, the head of the west, the great god, master of eternity, Lord of Busiris, to the head of Abydos, the sovereign of the beyond. That he gives breads, beers, birds, pure [...?] which comes from sound [...?] for the Ka of the Osiris, the high-priest of Menkheperre, the favoured one, Khonsu, justified, in joy". In front of the stela stand two beautifully made golden sarcophaguses In the foreground, although positioned slightly behind, can be seen the sarcophagus of a woman and next to it is that of a man with his false beard. 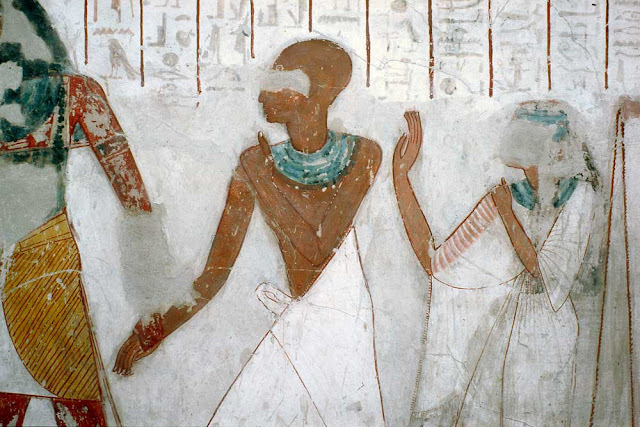 Due to the lack of descriptive text, it is quite possible that this last one contains the mummy of Khonsu, it is also uncertain if the woman is his first wife Ruia, or his omnipresent mother. Indeed, it cannot be Mutia, since she is standing in front of the coffins, moaning, identified as: "His wife, the chantress of Amon, Mutia". The other mourner, who kneels on the ground, is "His daughter, [the chantress] of Amon, W[ia]y". The first two priests each make a libation of water with the help of a vase. They hold to the mouths of the mummies two implements, used to perform the ceremony of the "Opening of the Mouth". 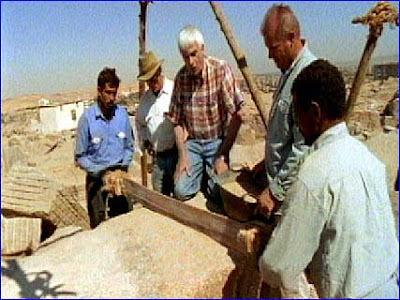 The "lector priest of Menkheperre, Khaemwaset", is going to touch the mouth of the anthropoid coffins using the ivory adze (a "wr-HkAw") in order to open it. 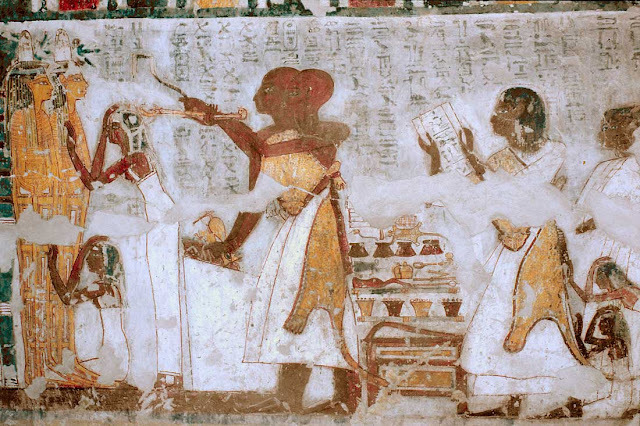 The other is the "lector priest of Menkheperre, Khay" pronounces the classic formula of purification whilst holding the Heru, a spooned-shape implement for offering incense. Behind the two officiants is a chest with, represented above it, its content of instruments and necessary items for the ritual. 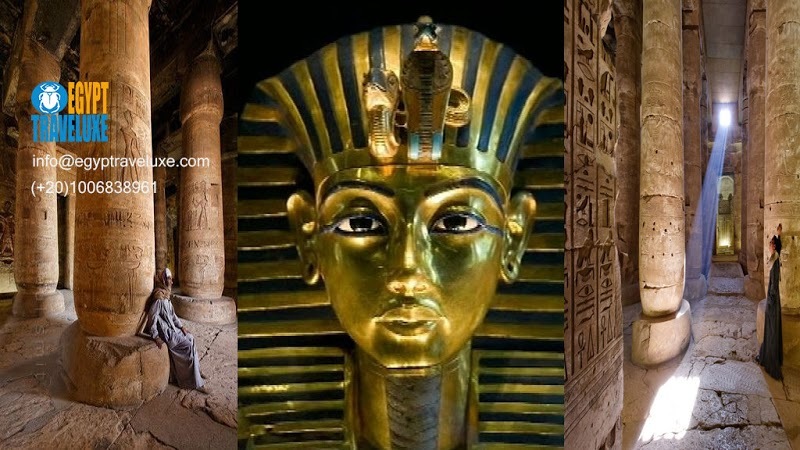 Behind the chest, is "His son, the high-priest of Sobek, Usermontu, justified", who reads, what can easily be seen inscribed on the papyrus which he holds, the formulas "To do the opening of the mouth for the Osiris, the high-priest, To". The right-hand side of the wall is very damaged (. The group of mourners include six "mourning women, who weep", two are pictured lower than the four grouped together, one kneeling and one leaning forwards. These are followed by four men, arms raised above their heads. 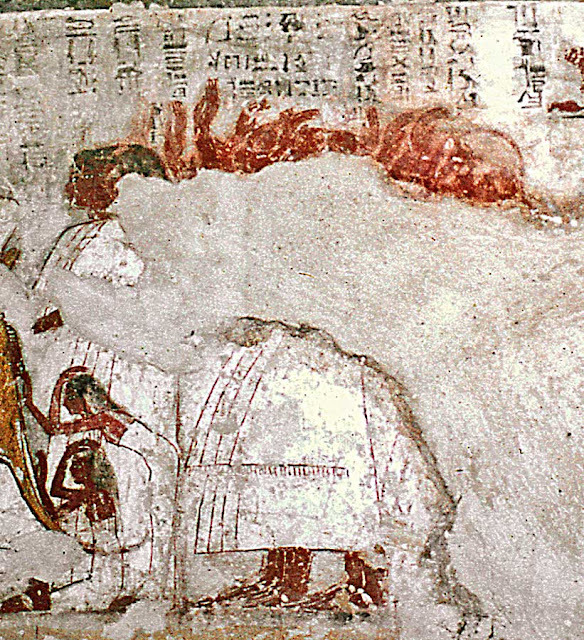 The text mentions "the wab-priests and lectors of the temple of Montu, Nebamim and Usermont", both are sons of Tentiunet; "their father [...] Raria, the wab-priest of Montu, Pashed, son of Maany". These are then followed by two more women, with hands raised to their heads, these are wrongly named "the charioteer, Raria" and "the high-priest of Sobek, Usermontu". Chronologically, this precedes the events which have just been seen. Very little has survived: the heads of six (2 rows of 3) hauliers, and the mutilated image of the sledge on which rests the bier of the corpse, in front of which (left) is a priest pouring a libation of milk: "To make the purification in front (of the cortege? )", whilst repeating four times "doubly pure". 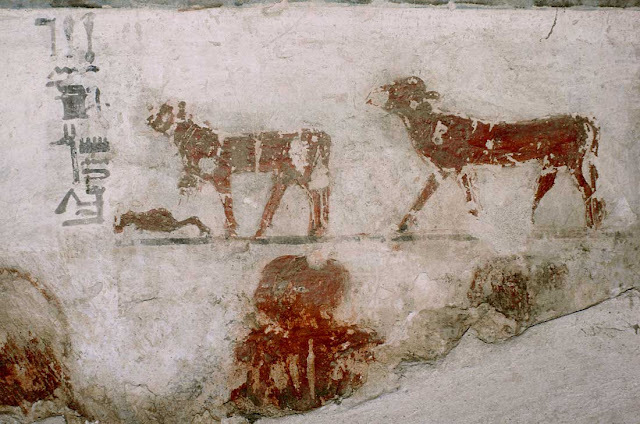 There is a scene which raises the question of the love of animals which is frequently attributed to the ancient Egyptians. The ritual of the opening of the mouth foresees the presentation of a young cattle leg (the "khepesh") before the mummy, in the form of the ivory adze. In order to do this, the small calf seems have been amputated, whilst alive, under the knee of the right leg, in a way this is the "hand" of the young animal. The paw lies on the ground, whilst the stump bleeds. Nadine Guilhou thinks that it represents a metaphor representing the ablation of the hands of Horus by his mother in the tale of Horus and Seth. The reality of such a ceremony, which had to (without anachronism) appear barbaric, even to the Egyptians of the New Kingdom, remains under debate.